Buckle your swash and get ready for gripping action in the great tradition of Dumas, Sabatini, Verne, Defoe, Salgari, Stevenson and Morgenstern. 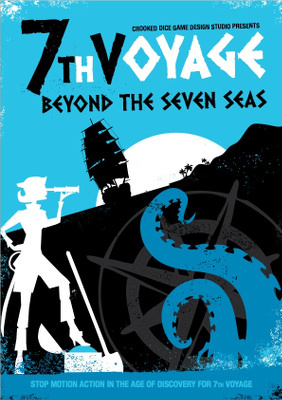 Beyond the Seven Seas brings the excitement of flashing blades, thunderous broadsides and dark plots to the world of 7th Voyage, all wrapped up in a glorious package of exotic locations and fantastic costumes. Beyond the Seven Seas expands on the stop motion action brought to you in 7th Voyage. Set during the golden age of exploration, Beyond the Seven Seas captures the high seas action of the early Hollywood silver screenings of the great adventure novels. This supplement allows you to recreate swashbuckling adventures from the 16th to the 18th centuries. Repulse Barbary pirates in the Mediterranean, thwart treason, explore fantastic civilisations in the New World or confront exotic customs in the mysterious Orient. Beyond the Seven Seas has it all. This supplement covers the ruthless jungles of Aztec America, courtly intrigue of pre-revolutionary France and the birth of Shogunate Japan. Written by me it is available as a PDF download from Crooked Dice.